Whisk together eggs, coconut oil, coconut milk, cinnamon, and salt in a bowl. Whisk in coconut flour and let sit for 5 minutes. Heat griddle or cast iron skillet to medium high. Grease the surface with coconut oil. 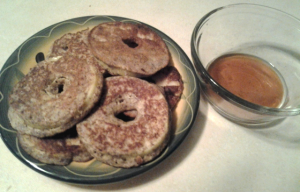 Using a toothpick, pick up each apple ring and cover it in pancake batter. Place the rings on the griddle. Once the batter has become firm around the edges and turned golden brown, flip the rings and cook the other side until golden brown. Serve with real maple syrup or top with slices of cheese.